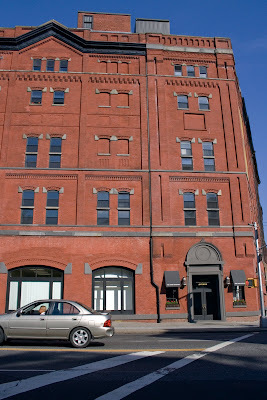 According to Kevin Walsh at forgotten-ny.com, this building was originally the Bernheimer and Schwartz Pilsner Brewing Company, built in 1905. Now known as the Mink Building (presumably because it was a fur storage center for 50 years), it's mixed use, office and retail space. 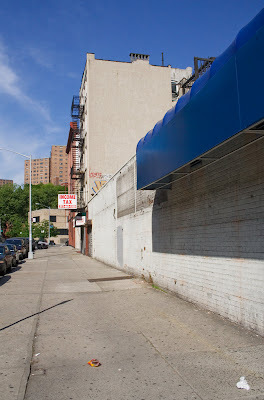 It is on the north side of 126th Street. And on the south side? A live poultry store! Yes! 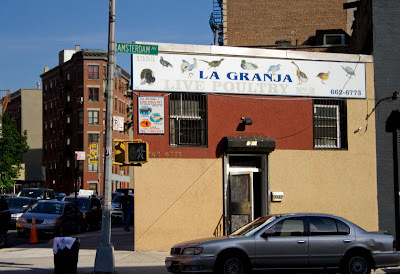 Below La Granja in very faint lettering, it says Live Poulty. See below. 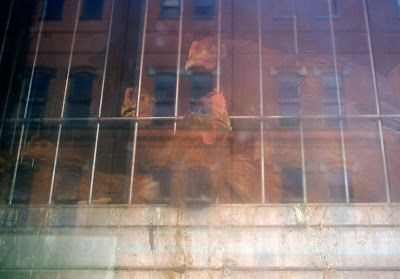 The Mink Building is reflected in whatever is between us and the chickens. 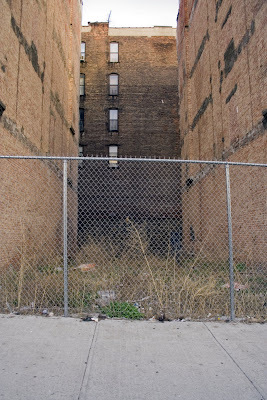 The New York Times recently had an article about slaughter houses in New York City. Interestingly, they're on the increase. There are now about 90 live poultry markets in the metropolitan area and that is double what it was in the mid-90s. This is because of increasing demands from immigrants who want to check out their food before they select it. Far from being incongruous to have these places in New York, we have "probably the country’s highest concentration of live-animal markets." It's a big city kind of thing, I guess. Same block. South side. I love this building. That doesn't mean I want to live there. North side. I would not have posted this photo if I hadn't found out it's an historic church. Because I don't like it as a photo is why. But I thought it over and decided I couldn't deny you the opportunity to improve your minds. 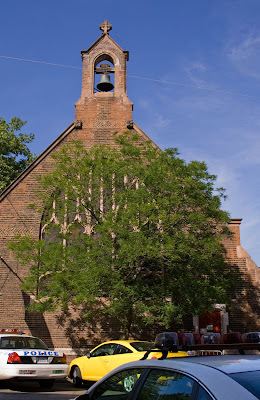 This is St. Mary's Episcopal Church, founded in 1823. 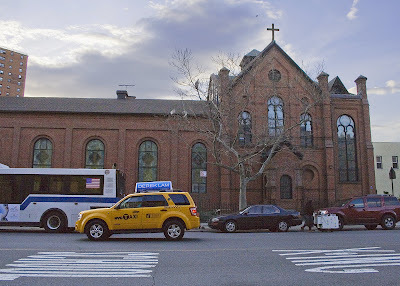 It is Harlem's oldest church still in its original location. 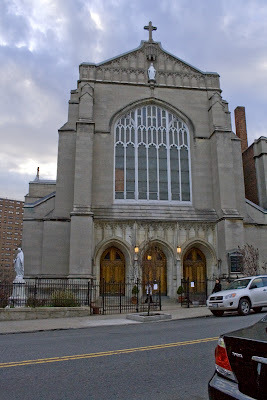 Its congregation included the widow and children of Alexander Hamilton, African-American abolitionists (yes, it was racially integrated), and Daniel Tiemann, Mayor of New York in 1858-59. There is a street named after Tiemann in Manhattanville which I haven't walked yet. 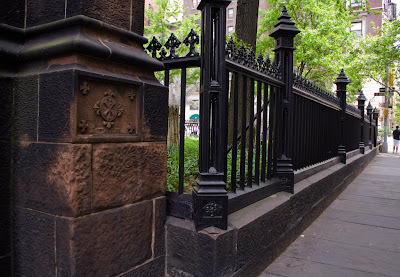 It became New York's first "free pew" Episcopal Church in 1831. Before that you had to pay for your pew. I looked on the web for more information about this pew thing and look what I found: freepews.com. Yes, church pews, free for the taking. They won't ship them. Unfortunately for us New Yorkers, there are none in New York City just now. Maybe tomorrow. But if you want to go to Elmira Heights, NY, you can have your choice of or all of 10', 12' and 16' pews, complete with book racks. Uh oh, I seem to have worked myself into a fit of pew desire. Luckily, I can't do anything about it. Back to serious matters. You should read this NY Times article from 1866. Note that you have to scroll down to catch the beginning. Back to 126th Street and noticing how different the north and south sides of the street are. Here's the south side of the street. And now the reason for the angle parked cars becomes clear. It seems that the police have to break the law in order to enforce the law. Something like that. And here's the north side. 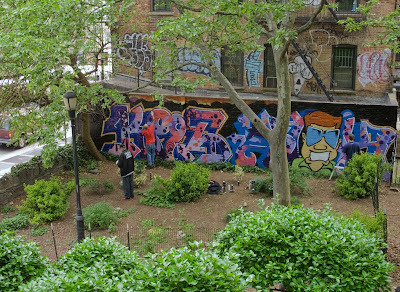 This is The Sheltering Arms Playground, named for the Sheltering Arms asylum for children which was once located here. 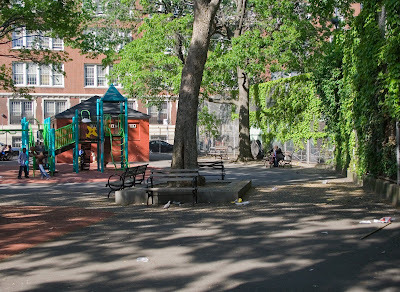 The Parks Department has a nice article about the playground, the asylum, and Manhattanville. Old Broadway used to be a bend in Bloomingdale Road and after Bloomingdale Road became Broadway and Broadway was straightened, it was lopped off. Thus Old (bendy) Broadway. 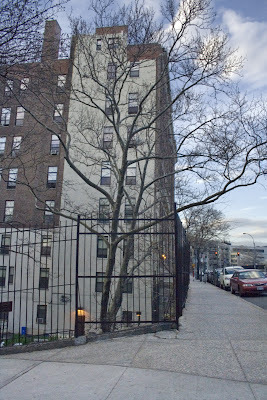 Then in 1961, the Manhattanville Houses were built (we saw one of the buildings last night), and cut the street into two pieces. 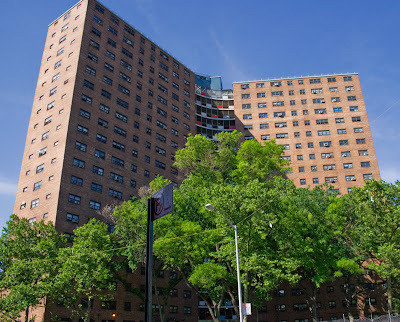 Two blocks on this side and two more from 131st to 133rd Streets. This is one of those streets that I get curious about just seeing them on the map. 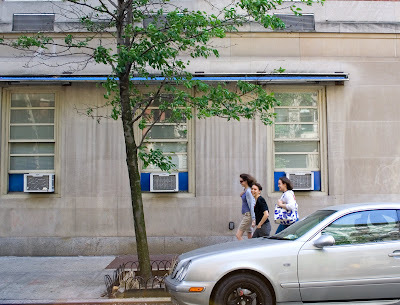 So this is what we have: a pretty little synagogue, the Old Broadway Synagogue, recently renovated. 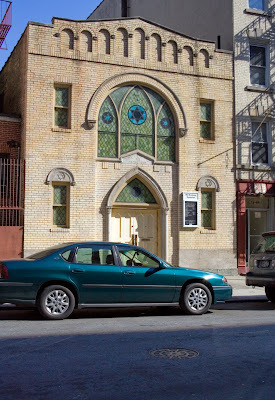 Notice the turquoise car which matches the stained glass. And a white wall with blue awning looking like New Mexico today. Check out the map. It shows Old Broadway on the other side of 126th Street as just a little nub before it runs into 129th Street. 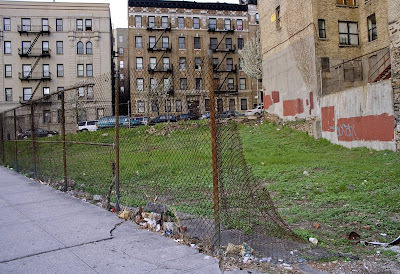 Mainly the grounds of the Manhattanville Houses. 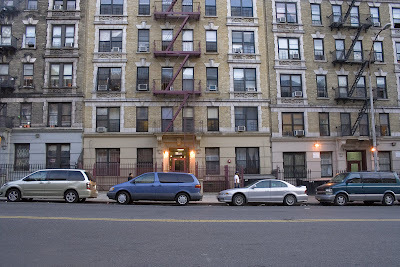 And it shows, better than words can tell, why we go from 126th to 129th Street at this point. 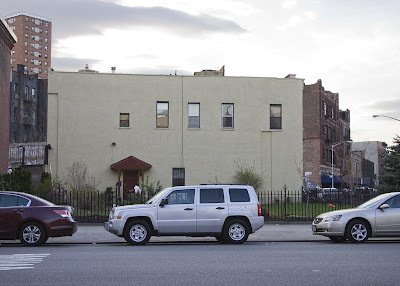 As I walked along 126th Street, I noticed that the north and south sides of the street were very different, at least on the first few blocks. This is the south side. And below is the north side. We saw this building from Broadway back in February. This day in May was brilliant. The sky was that blue and the trees were that green. There was an expansive lawn around the tall building, but no people were taking advantage of it. On the south side, however, men sat around in chairs on the sidewalk. They wouldn't let me take pictures. Uhn, uhn, they said, shaking their heads. The last time I was here, I went home and read about Manhattanville and learned about Columbia University's expansion plans. Not surprisingly, there have been protests and lawsuits. 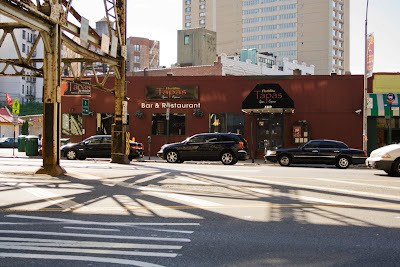 Maggie Astor, of the Columbia Spectator, has been reporting this story and one of her articles concerned La Floridita, the tapas restaurant above, regarding negotiations with Columbia about a possible land swap deal. 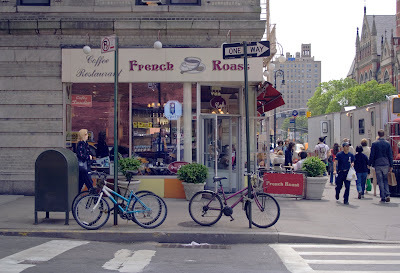 Ramon Diaz, the owner, was worried about the impact a change in location would have and said, regarding that location, “It’s the Champs Elysées [of New York]—I’m on two of the most famous streets in the world." Hmm. Well, maybe if the Champs Elysées had a rusty old viaduct running down the middle of it. I hadn't taken a usable photograph of La Floridita, so I couldn't use any of that material. Today I had my second chance. See the green striped awning at the right of the photo? 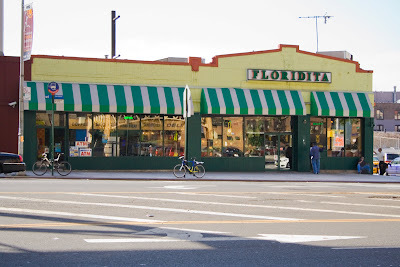 It's the edge of Floridita, a much more casual eatery, shown below. Diaz said his uncle came from Cuba and opened La Floridita in 1965, and at one time had 7 of them. Was this the original one? If you know, please let me know. 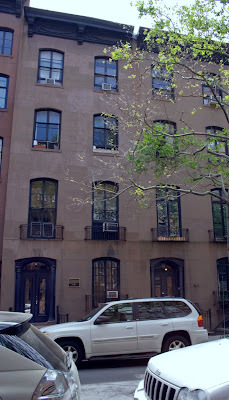 This is the last shot of this walk, but before we leave Greenwich Village, I want to lament my failure to remember that 11th Street is where the townhouse was that was accidentally blown up in 1970 by the Weathermen, three of whom were killed in the blast. I walked right by it without a clue! Dammit. 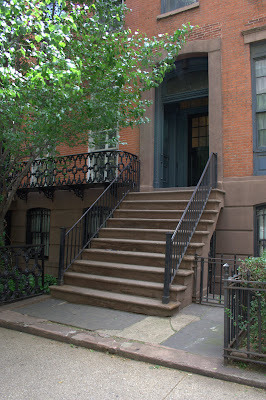 It's at 18 West 11th Street and I've found pictures of the house that replaced it, so I know I didn't photograph it. Read a good account of it here. And isn't this a pretty picture in spite of itself? This plaque is right there on the building, telling when it was built and by whom and what style it is. Everything I always want to know. Why don't all buildings have them? You will also be able to know these things if you enlarge the photo. And here's one on the building next door. I cannot find out anything at all about Irving and/or Jean Scholnik. Makes me kind of sad. Here's the destination: First Presbyterian Church. 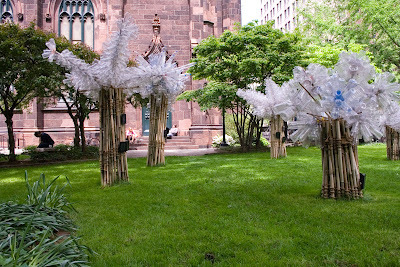 And a couple more photos of Tree Gems. This could be a painting by Morandi if he did streets. 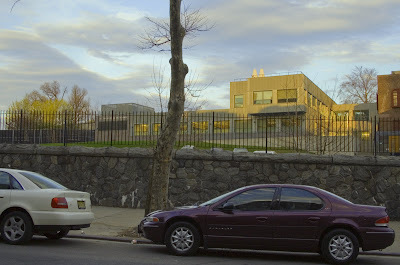 The New School, (main entrance on 12th Street). The most interesting thing I read about it was that it was founded in 1919, at least in part, as a result of Columbia's joining in the national paranoia and fear during and after World War I. One of the founders was Charles Beard who resigned from Columbia in protest of its firing of a noted professor, James McKeen Cattell, for his opposition to military conscription. Ninety years old now. Can we still call it New? 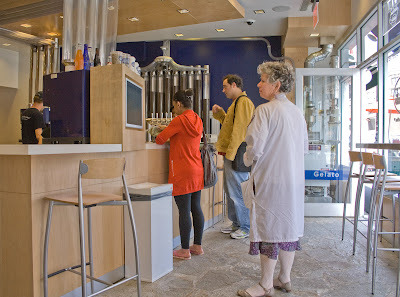 French Roast gets mixed reviews. That's because sometimes it's good and sometimes it's mediocre. Sometimes the servers are nice and sometimes they are rude. You takes your chances. However, it is definitely useful, being open at all times. Barbara, Thea, and I had lunch here the day I came down to "help." Well, I did help some. We enjoyed our lunch, as I recall. Spring! Doesn't this remind you of a field of daffodils? 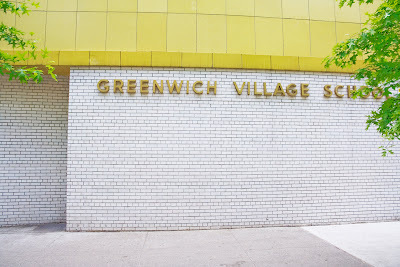 This is Greenwich Village School, grades K-5. Back to 11th Street. 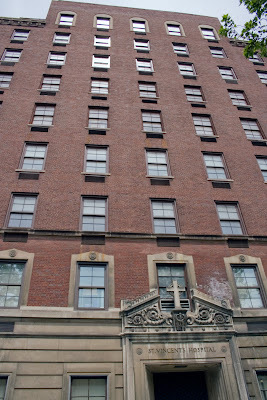 This section of St. Vincent's Hospital was completed in 1930 and, if the eye can be trusted, is the oldest of this group of buildings. I looked and looked and couldn't find out what happened between the little brick house on 13th Street in 1849 and this 1930 building. If this were the St. Vincent's Hospital Blog or even the 11th Street Blog, I wouldn't give up, but it's not, so I give up. I must interrupt the 11th Street photowalk for a very exciting event. 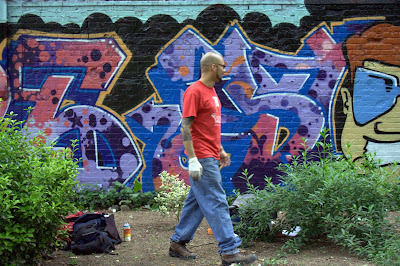 Yesterday I came upon a new Inwood wall painting as it was being painted. 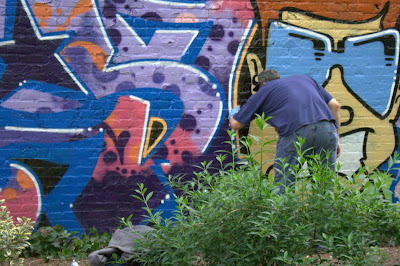 I have never, in all my walking days, seen street art as it was being made. And I met the artist. Alan Ket. Very well known in the street art world. There he is in the red shirt blending into the painting. And this is Stak. He did the face. This is the man. If you want to see his face, click here. Okay, enough fooling around, time to walk. 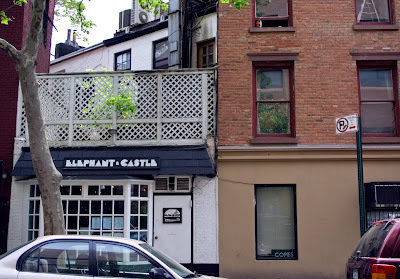 Elephant & Castle has been around for a long, long time, since 1973. I checked out the menu in the window and it sounded good and tempting, but I dunno. I've always been so annoyed with its name that I just wouldn't go there. Oh, grow up, I say to them. Elephant & Castle indeed. Is Babar one of your regulars? Obviously, this is my problem, not theirs, as they've been here a long, long time. So I walked right into Roasting Plant Coffee and ordered a small skim latte. And I had a chocolate chunk cookie, even though it was my diet day. I diet every other day. But what the hell, I had to make a full report to my readers. Good thing I got in before the crowd came in. Notice the gal in the red has on a jacket and flip flops. It was that kind of a weather day. Not too warm, not too cool. Okay, the first thing to know is the sizes are small, medium and large. None of this having to think, uh, what should I say if I want medium? The second thing is that they don't just grind the beans immediately before they make your cup, they roast their beans every day on site. Thus the stainless steel and plastic tubing. See those little desks or booths in the back? 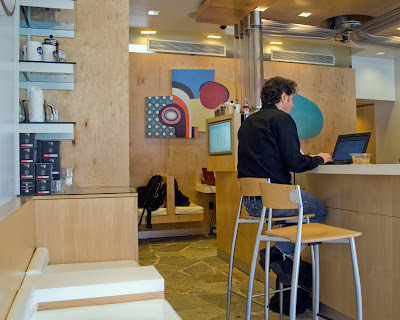 You can bring your laptop in and plug it right in. I want a laptop. So the coffee? Excellent. So was the cookie. It had that homemade taste, the one you taste in the top back of your mouth. Okay, I'm starting all over again, this time at the beginning. It's a good thing I have a therapy appointment at 11:00 once a week because it gets me out of the house. You know all those times when I say I got a late start, didn't get out of the house until 4:00? Those are the days I don't have a therapy appointment. It's true I'm tired on therapy days from getting up so early, but I'm at least I'm out and can operate a camera. So I took the No. 1 to 14th Street, but got off at the 12th Street exit. This is what you see when you emerge. We are in the Village now, even though it doesn't look village-like. 14th Street is the northern border. This is one border that doesn't change. 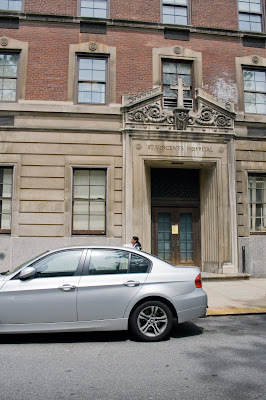 This is St. Vincent's Hospital. 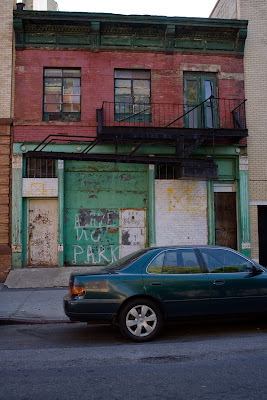 It's been around since 1849, beginning as a mere 30 beds in a small brick house on 13th Street. 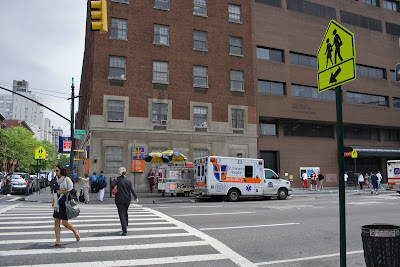 At that time it was one of the few charity hospitals in the city. St. Vincent, himself, was the patron saint of charities and hospitals. Um, there's probably a connection there. Okay, here's one of those complicated intersections where three streets cross, and on the east side of the avenue, the streets cross perpendicularly, but on the other side, they take a steep turn south. Please pay attention. 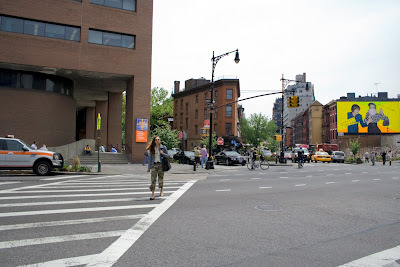 The girl walking toward us is walking across Seventh Avenue with the south side of St. Vincent's on the left. Now see the small red building in the middle? 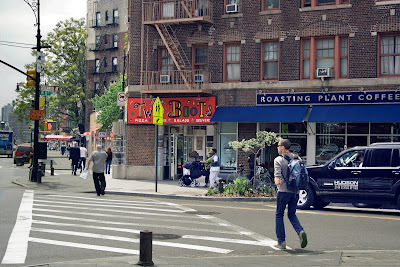 To the left of it is 11th Street and to the right is Greenwich Avenue. 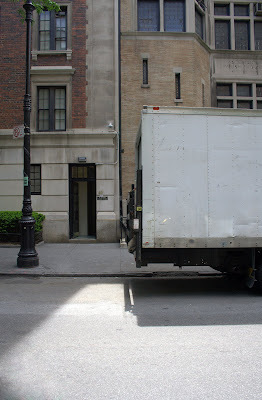 But on the other side of Seventh, 11th Street will cross over and head downtown and so, be south of Greenwich. I hope you're still awake because it gets snappier now. Now if I turn my head to the right, this is what I see. Hmm. One of those new boutique coffee shops. I could use a good cup of coffee. 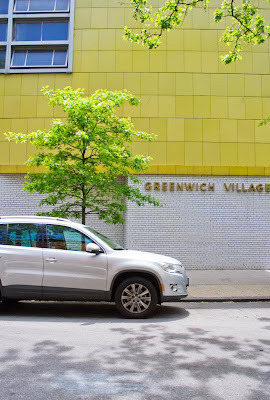 By the way, this is Greenwich Avenue. We have a new photowalk. I skipped ahead to give this unmistakeably NOW shot. Tree in full leaf. 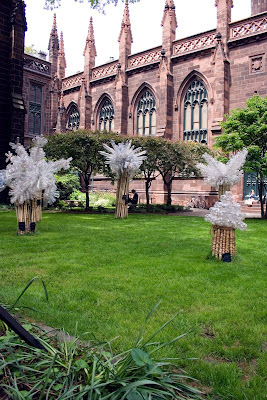 I went downtown today to catch Barbara Lubliner's and Thea Lanzisero's Tree Gems, an installation in the garden of The First Presbyterian Church. Now, come to think of it, it'll only be there a few more days, through this Sunday, May 17, so I better jump ahead to show you a shot of it, so you can decide if you want to run down and see it while you can. Whew. That was a long sentence. 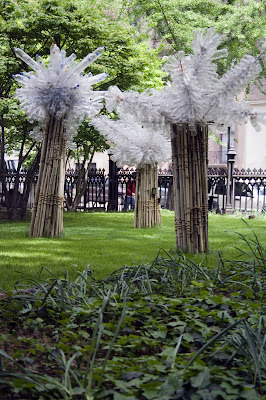 Those are plastic bottles atop lashed bamboo. They have solar power things (?) on them so if they catch enough sun during the day, they'll glow at night. Tomorrow I'll begin at the beginning. 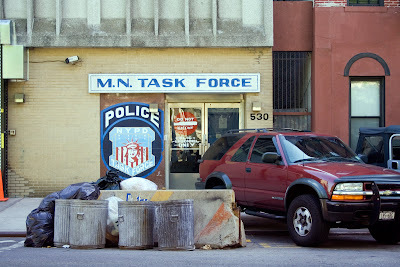 This is now being used for storage; the sign on the front says Tuck-it-Away, one of many in Manhattanville. But what was it when it was built? Oh, to go back in time. On the way home now, heading toward Broadway. This is Aaron Davis Hall, a performing arts center. Doesn't look real, does it? 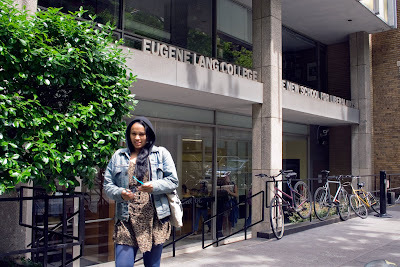 To read Harlem One Stop, you'd never know Davis Hall is part of City College. All they have to say about that is that the City College campus is adjacent to Davis Hall. Not so fast, Harlem One Stop! What about this? Hmm, well, upon further surfing, I have lost some confidence. 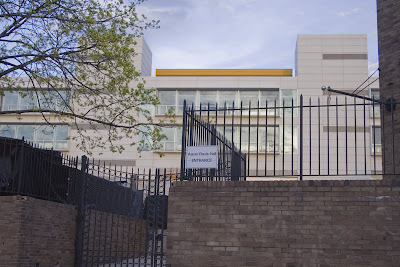 I guess just because a building is on your campus and you talk about it on your website doesn't mean you own it. I retire in confusion. Now on the other side of the street is the South Campus of City College. That's City College of City University of New York. Sometimes known as City. The South Campus is the new campus, having been acquired in 1953, whereas the North Campus was constructed in 1906. The University, of course, is older than that (1847) and you are welcome to read all about it in Wikipedia. This is the Church of the Annunciation, a Catholic church. I could find nothing on the web except its name, address, and telephone number. Most mysterious. I was just looking at that bare tree and thinking how all the trees are leafed out now. Hmm, how long ago did I take these photos? Good grief, almost 3 weeks ago. It should be time to move on, but what can I do about all this rain? Just think how different this shot would be today. Nothing but tree. 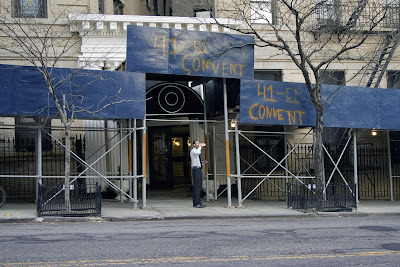 This is the first block of Convent Avenue. I want to alert you to the fact that I am now in the 21st century map-wise. If you click on the map link below and go to the street view, you can get a 360° photographic view of the current location. I wonder why they didn't hire me to take all those photographs. Well, not really. Speed was probably what they were looking for. I want to know what was here, how long it has been gone, and why it was taken down. I have a Thirst for Knowledge, or, you might say, a craving for useless information. 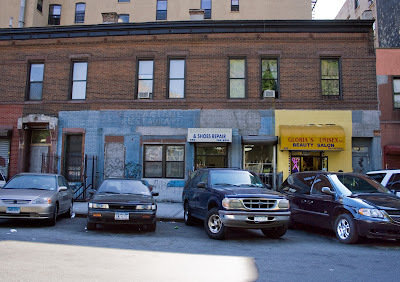 Morningside Avenue does not end at 125th Street as it should, but pushes on to 127th Street where it then abruptly stops. Convent Avenue takes over from there and we will see it tomorrow. Home from DC visiting my son, Bill. This time we did the tourist thing for the first time in years. I wanted to see the Vietnam Memorial again, which was as moving as the first time I saw it. We walked the Mall, saw the Capitol and the Washington Monument and Lincoln Memorial all lined up. Beautiful as ever. It was good to do. Now I have to go back and pick up from BEFORE the last post. This is across the street from the M&G Diner, the Church of St. Joseph of the Holy Family, the side of the church, of course. 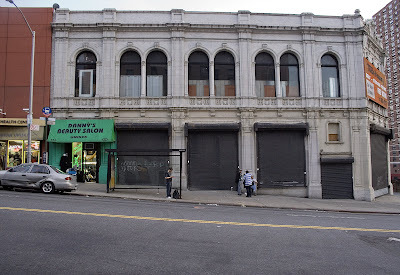 The front is on 125th Street. Now see that little piece of beige building on the right? Here it is. Another one of those blank, 2D buildings I love so much. And I love how the windows look like abstract paintings. It makes me want to paint. Or maybe it was seeing Philip Guston in Washington that makes me want to paint.